Adventure Island® guests are in for an epic journey on the park’s newest thrill ride Colossal Curl™, set to debut at Tampa Bay’s premier waterpark in 2015. True to its name and holding up to four passengers, this mega slide delivers a high-adrenaline, action-packed adventure, making it the ultimate family thrill slide and adding to the waterpark’s unrivaled combination of corkscrews, waterfalls, high-speed thrills and tropical, tranquil surroundings for guests of all ages. “We’re excited to continue in our tradition of offering thrilling rides, and slides, at Adventure Island and Busch Gardens® Tampa”. Colossal Curl™ will be located in the center of the park, next to Mango Joe’s Café®, and will take the place of Gulf Scream. The slide will be the tallest ride at Adventure Island at nearly 70 feet high and 560 feet in length. Construction on Colossal Curl™ will begin in the coming weeks and by early 2015 many of the ride’s features will be visible to guests. Riders will hurtle high above Adventure Island’s 30 acres of water-drenched fun in the sun and experience a feeling of weightlessness aboard Colossal Curl™. This colorful slide combines funnel and wave elements for an exciting ride that’s sure to get hearts racing. 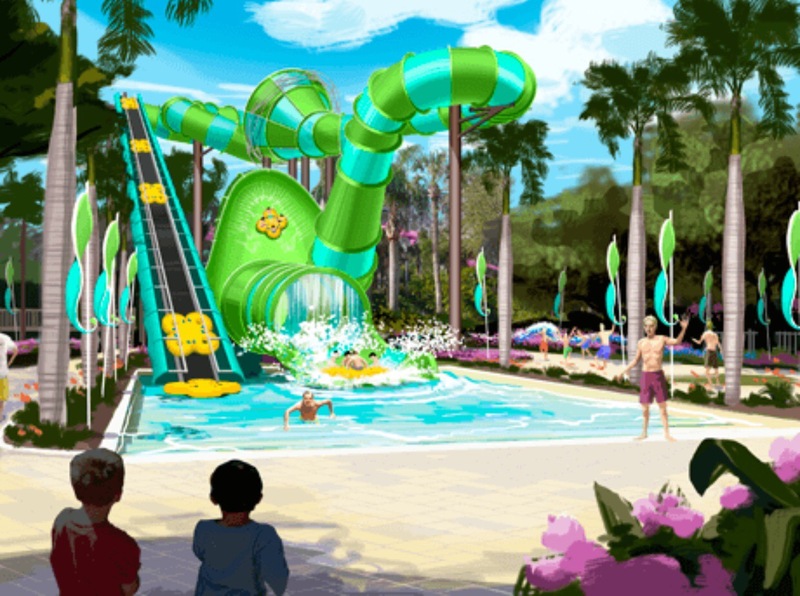 This is the first new attraction at the waterpark since 2006, and the ride is expected to open during the 2015 Adventure Island season, which begins March 2015.